TGFP (Thank God For Prince). Kinda funny - June 7th would just be another day if not for Prince. Today is a great day to celebrate!! 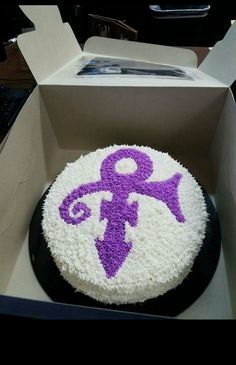 Happy Birthday Prince! Happy bday P. I'm spinning wax all day in tribute. But what kind of cake is that and can I get a virtual slice. Ha. Dang that looks good. I was allowed to play DJ at a local bar last night--they have a regular Tuesday night slot for music fans who are not professional DJs--and I got the approval to play four solid hours of Prince in honor of his birthday. (I know he didn't celebrate birthdays later in life, but I can!) Of course that still wasn't long enough to fit in all my favorites, but I got to play a lot of them, and it was a blast. The crowd dug it, too. Happy bornday to the best that ever did it. 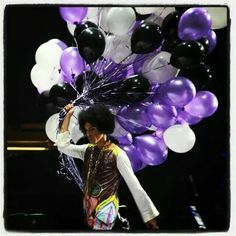 Happy Birthday Prince, love you 4ever! Happy Prince Day, Everyone! Have a purple party where ever you are! Four Solid Hours of Prince. Where was this at? 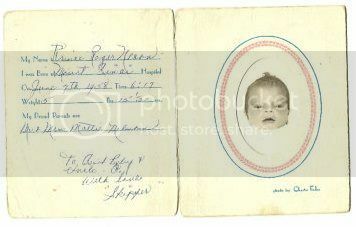 this was up for auction on Ebay years ago... and i saved the image. but the auction suddenly ended... there was a topic here at the time. some wonder if Prince's people did not reach out to the seller? "Happy Birthday Prince & The Revolution - Parade Tour - Detroit USA - June 7th 1986"
it should be okay to post! But I am not taking that risk. Happy Birthday, Prince.. inspiration, teacher, friend. How can you not consider somebody a friend when they bared their soul to you over the course of 30+ years? I love you and miss you. Thanks for making life funky. I'll be watching my new SoTT blu-ray tonight, and seeing the Revolution live on Saturday night. We love you, miss you and we'll never forget you. Maybe he has an Internet connection and can read the web in Heaven? Here's TO you, my man...! Dearest, Sweet Prince: I know you did not celebrate Birthday's because you believed that we only have "one" birthday; the day we were born. So today, we are gonna sing, dance and celebrate all the wonderful gifts you have given to us during your incredible 40-year career and 57 wonderful years visiting this planet. Today, we laugh, we cry, we rejoice, we remember your beautiful spirit; your incredible energy; your artistic passion; your incredibly beautiful soul; your philanthropy; all of the beautiful music you left behind for us to enjoy. And so, your legacy continues. We love you and miss you more than words can ever say!! I dedictate this song to you, Prince. You are our "Angel". Love4OneAnother until we meet you in Purple Paradise. That is the most beautiful cake I have ever seen!! FINALLY, I was able to post on'Prince - In Memorium June 7, 1958-April 21, 2016', tonight.........sentiments too difficult before. Watched Purple Rain movie tonight, after many years. So fitting.......as the movie approached the song 'Purple Rain'......the rain started and progressively poured into the song (I'm in Sydney, Australia) .......many purple tears flowed. After a year, it has finally taken me the time to acknowledge Prince and part of what he means to me. We will get there.....some day.